The GS Series stereo microscopes combine a compact design with a sharp 3D image and a wide field of view to provide a great tool for manufacturing, quality, engineering, educational and pro-hobby needs. The latest precision optics design produces excellent contrast and high-definition images, all the way out to the edge of the field of view. The 2X to 270X total magnification range makes this scope flexible enough to view a wide variety of objects. This microscope track stand comes with a halogen transmitted 70mm mirror base with a manual adjustable angle for variable light control. The GS Series microscopes are perfect for high-throughput inspection stations, Q.A. and Engineering labs, conference rooms, or any place you want to quickly and easily magnify a sample. These microscopes can also be useful in both higher education & hobby settings. 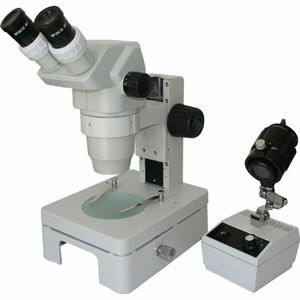 The GS-01100 is a binocular microscope; the GS-01150 is the trinocular version. The third port on the GS-01150 can be used to mount a CCD camera, digital camera, or DSLR for processing micro-image acquisition and storage. Click here to see our camera selection, or use your own camera with our camera adapters. 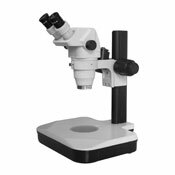 The optional eyepieces, auxiliary lenses, and video coupler makes this model of microscope applicable for a wide variety of applications. It is available bundled with a wide variety of illumination selections.